Space X was founded by Elon Musk, who also founded Tesla Motors. It hopes to revolutionize the launch business by making it easier and cheaper to dispatch rockets that may one day carry people to other planets. Tuesday's launch, the seventh flight for the rocket, occurred at 5:41 p.m. EST (22:41 GMT) from Cape Canaveral in Florida and required Space X to perform a significantly more difficult task than it has with prior launches. Rather than simply send a payload into space, the launch of a communications satellite requires a two-step burn of the rocket's engines. The satellite first needs to be taken to a parking orbit and then, after a few minutes, engines are reignited to carry the satellite into geostationary transfer orbit. 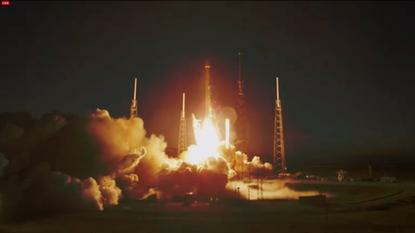 "Falcon 9 second stage restart burn successful. Orbit looks nominal," Space X said in a Twitter message. From there, the satellite can make it into a geostationary orbit approximately 36,000 kilometers up, in which the satellite's orbit matches that of Earth's rotation. That means the satellite appears to be stationary when viewed from Earth and allows for the use of fixed satellite dishes. "Spacecraft separation confirmed! SES-8 is now in its targeted geo transfer orbit," the company said in a second message minutes later. Getting the launch right was important for Space X. It not only proves the young company's rocket technology but also gives it a place in the commercial satellite-launching industry. Space X had attempted the launch several times in recent days. On Nov. 25, three attempts were made during a four-hour launch window, and on Nov. 28 two attempts were made. One was aborted as the engines were being ignited, apparently because they didn't achieve thrust level fast enough. The SES-8 satellite will provide telecommunications and television services to customers in Asia from an orbital position at 95 degrees East. The satellite will have two beams, one covering the Indian sub-continent and another covering Indo-China.